Jason plays guitar in a teenage garage band called the Assorted Zebras, but they have no fans, no gigs, and they’re going nowhere. Even worse, Jason has a crush on their lead singer, but she doesn’t seem interested in him at all. Then Jason steals instruments from the fairy world. Soon the band is enchanting crowds, and Jason is a step closer to the girl of his dreams, but the new gear is brimming with dangerous and destructive magic they can’t control. 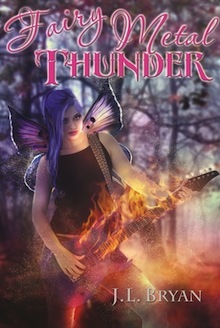 Fun and quirky; Fairy Metal Thunder is a quick read that you can easily finish in one sitting. After highly enjoying Jenny Pox, I was especially curious to see what JL Bryan had done with his attempt at a YA novel – about fairies nonetheless. First let me tell you that this could not be any more different from Jenny Pox, and I was greatly impressed. This is plain and simply entertaining with an effortless writing style that makes it easy to get absorbed inside this enchanting tale full of music and magic. Fairies, goblins, elves, and… get this… a unicorn! And this is no ordinary unicorn either! The sweet, pretty, innocent creature is no more! *pets evil unicorn* It was fun to have these exotic mythical creatures bringing in even more life to the party. From delightful commentary on the realm’s past wars, to bizarre and disgusting eating habits; there is no lack of comical antics in this story. Overall we’ve got a great cast with all types of personalities to enliven these pages. Going from one realm to the other, the plot is pretty straight forward with the Fairy band trying to find their instruments, and the Man-band (teehee) exploiting them. There’s nothing too complex; it’s a very light read in that regard. The Fairy lore is original and creative, although since we spend much more time in the human world, we don’t delve incredibly deep into Fairy technicalities. But we do get plenty of descriptive details when Jason visits the supernatural realm to boost our imagination of this eccentric land, as well as glimpses of what’s coming for these kids in the next books. Magic music! That’s what you get inside JL Bryan’s charming YA novel. If you want something refreshing and genuinely fun, this is the book for you! Everytime I see a review on this one I want to read it, but am so overwhelmed right now. Maybe soon! I love the *pets evil unicorn* part of your review….definitely need to read this! I’ve never heard of this book before ! It sure does look original! I bought this last year,, and like with a million other books, I have not had a chance to get to it yet. I will eventually. I was supposed to get to Jenny Pox for the Indie Epicness Group thing, but I was too busy reading the ATWD series lol!! 😉 Awesome review chick! I will have to get to this soon. If you liked it I know I will. I’ve had this book for ages! I need to read it now!! I also have Jenny Pox. Man, I’m lame for letting these go unread. Great review! I loved this series so much!! Even though I now know that I say Aiode completely wrong… but that’s OK! They just keep getting better as well! This definitely sounds fun and quirky! Thanks for the heads up on it. I hadn’t heard of it. I have this waiting for me on my NOOK (thanks to YOU!) and must get around to reading it soon. I love JL Bryan!!! He’s awesome! I’m soo eager to read this one but I never had time for it.. shame on me!!! Everyone of my trusted bloggers loved this book! Thanks Giselle, this sounds like a cute fun adventure! OMG. The title of this book is totally cracking me up. And then the band name! And an evil unicorn–yahoo! Sounds pretty darned funny. Thanks so much ladies! I hope you enjoy this one too!! It looks interesting. I may have to pick this one up. I like Rock N. Roll and fairys. Thanks for the review. Awesome review! This one just sounds so FUN. I love fae, and I love, love, LOVE unicorns, so I think it’d be right up my alley. I just kind of adore the whole concept. Sounds like a really fun read! I won an ecopy, but I haven’t gotten to it yet. @Lexie: It sounds like you’d really love this one chick! This sounds really fun and I LOVE the cover redesign. Unicorn, really? That’s awesome! lol…*pets evil unicorn* I really liked the book as well! TOTALLY different than Jenny Pox, but still a ton of fun! I’m well on my way to reading all of Jeff’s books cause he’s just so fab like that 🙂 Great Review!